MWE3: The new album sounds quite futuristic. 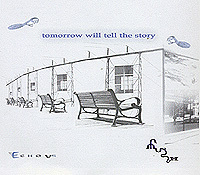 What was your musical mission with the Tomorrow Will Tell The Story CD? EM: Futuristic is certainly apropos. I have always been a huge fan of music that pushes boundaries but still relates to a common purpose - that anyone may be able to enjoy. When the inspiration first hit I didnt really know where its coming from or where it was leading. Things revealed themselves in layers over time. The instrumental sections of Ears of Eras came to me first, and my perspective at the time was that the album would be like a new version of its predecessor, The Tide Decides. As time went on and I had some crazy experiences during the initial few months of writing it became clear that the album, although a conclusion of themes started on The Tide Decides, was actually much more than that. In the past I had always felt closest to the songs that seemed to write themselves, but this time I ended up somehow conjuring concepts and energies with even more gravity than Id experienced before. The lyrics for This Is The Dream, The Dream Is You is a great example of this spontaneity. I just thought there is this thing, and the words came to me without knowing what they were - they were gibberish at first! I had to suss out what they were as best I could, phonetically spell them and look them up to get a decent pronunciation. I thought I must be trying to say something that is in the human psyche. I was correct...and me being not so religious, with just a little bit of Presbyterian upbringing in a small town I was not so familiar with theology or the phrases that were coming to me- namely YHVH/YHWH. So, it was a kind of religious experience in that sense. I am not pro-this or that, so my view is that it was just this experience and I rode it to where it wanted to go. I have learned a bit more about a variety of religious thought and practice for my own education, particularly Judaic because I knew the least about it or Kabballah, which I still feel Ive barely scratched the surface even now. 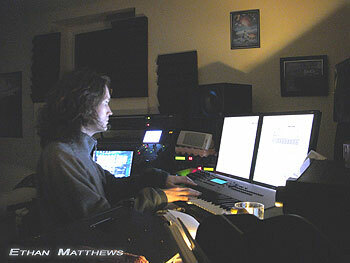 That is where I got the idea of utilizing Rawn Clarks work, contacted him and used parts of his canticle on the album. The album was a step outside for me. I kind of threw all my convictions about what Echo Us is and what I am willing to express out the window and just followed things wherever they went. I wasnt really in control, but in this case it was a beautiful thing. MWE3: How did you approach the sound in the studio and how was the album tracked and recorded and produced? Also when and where was the album recorded? The studio sound is very interesting. Its sparse yet quite effective. How would you describe your sound on disc? EM: That is always the trickiest area, and the area that requires an incredible amount of perseverance when working with offbeat material like Echo Us. 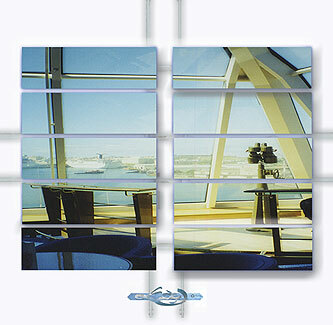 The entire project itself spanned almost three years, but with ample downtime. I moved twice during its production, and like a lot of people these days my studio is modest and in the living room of wherever I dwell. 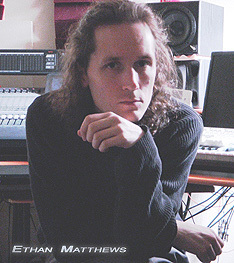 Regarding sound, almost everything is original and unique to the Echo Us sound library which is hand gathered; some sounds come from nature and the outdoors, many came from samples of the last album and the remaining bit - mostly the large sounding strings and chordal synth parts are reprogrammed on hardware. I am a big fan of space and accuracy, and I felt like I was able to achieve everything I was looking for this time. Writing and recording are completely fluid and combined for me. I tend to work on things over a very long period of time as mentioned; although the initial composition, lead vocal tracking and arrangement come within a few hours - one studio session in most cases for the songs on this album. As far as sound production, arrangement and mixing that goes on after the initial session that is what takes the time. Mostly because I am looking for things that are absolutely golden and, often times hidden and not obvious. As I change throughout the process things get better and better with a renewed perspective. As a songwriter and composer I was often told to get perspectives from others - and god forbid dont get so inside your music not seeing the forest from the trees - and that sort of nonsense. After college I planned on deliberately doing everything I was not supposed to do...not getting opinions often enough and burying myself in the process until I found every nook and cranny I could. Getting away from music and culture has helped me silence my mind and actually do the kind of work I dreamed of - because I am listening to a true inner self and the collective cosmos rather than taking cues from peers. We are so defined by language. When I am exploring alone language is not so much a barrier. I believe we are all connected all the time, but I mean it in an energetic sense, not just the sense of shared physical and intellectual culture mined through language. MWE3: It was pretty fortunate working with Henta on the lead vocals and vocal coloration. 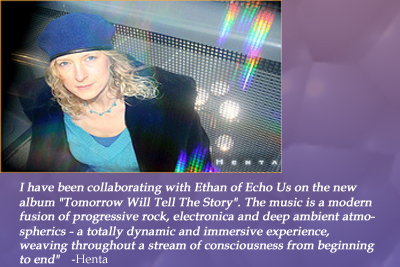 She has a magical sound... How did you meet up and start working with Henta and have you heard her albums? I know she was nominated for a Grammy last year! EM: Ya! Shes great... amazing vocalist and so wonderful to work with as well. I got in touch with Henta originally in late 2009 after searching for a second vocalist for many months. I read an ad in The Stranger from Seattle and found out about Henta and her work with Marcell Marias. I got in touch with her and maybe one other singer from Seattle. I live in Portland and no one does music like this around here, at least not that I am aware of. When I heard Hentas solo material I was extremely impressed. The songs stick with you and have that element of timelessness to them that so few artists seem to have it seems. Our musical areas are quite complementary, and the process has been very smooth. Much of our process has been remote as she has her own studio and were hours apart, but weve gotten together in Seattle and I am hoping to see both her and Marcell again soon. MWE3: Can you say something about the guitars and keyboards you used in the making of the album? EM: An old Epiphone hollow body is the main one. The heavier chugging guitars are samples from The Tide Decides - a seven string. As far as hardware in my studio its a substantial mix of older Korg, Roland and Kawai synths. I like most strange and offbeat machines like this Technics box I have... Technics made a real synthesizer at one point! (not a player keyboard or portable toy) - believe it or not! For instance the piano sounds on the album are that synth mixed with an old ugly Fairlight sample to give it some breadth. Ive kept my outboard gear, like old digital synths and havent moved everything over the computer like so many have. I a big believer in having as many different devices outputting sound as feasible, because of the alchemy you can create with diverse sources rather than just the software synths and mix buss/output of a computer. I still mix through a console, although it is a kind of hybrid way of mixing combined with the sample library in the computer that I started on this album. I am always looking for new ways to record and design sounds. Sometimes a bit of limitation is actually necessary to keep the game flowing though. We have so much available as software these days is almost overwhelming to me making any sort of studio upgrade. I like sticking with things that work... even if they arent perfect its okay, because you get to know their peculiarities and can work around them. MWE3: What is your main instrument and how long have you been playing music? EM: Guitar really... I still love playing it the best, although Ive been trying to keep my piano playing evolving in recent years so I can improv a lot more when composing. My Dad performed classical repertoire for the saxophone and taught music for years, so music was always there. My trek through it has been a lot different. I did attend school and have a lot of knowledge of classical and jazz, but I do not play them much in a traditional sense. I studied machines and sound in a room. 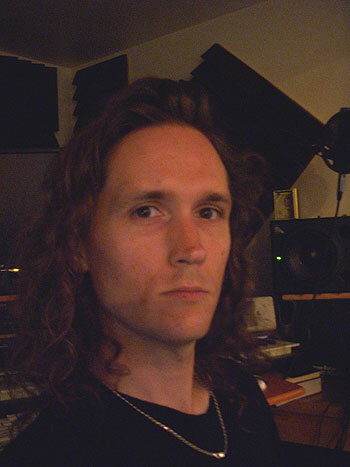 That said, I do perform all the parts you hear on record like the lead vocals, many many keyboard parts and guitar parts and much else because I want the feeling of humanity about it. So that is where the challenge is... to keep my musicians background and knowledge and at the same time expand my interests into other areas, whether its sound design, exploring new ideas for arranging and orchestrating, or metaphysics. MWE3: Would you say Tomorrow Will Tell The Story is representative of your musical style and how would you say your influences came into play in the writing and recording of your own album? EM: Ive been told its my best work and of course right now I feel that way having completed it. At the same time I look back at my older work, especially lately the debut... I think its still amazingly creative, but so different. I never seem to stay the same really. I view myself as a musical channel that is always flicking the remote when the commercials come on. I need things to be constantly stimulating and challenging. This album did that quite well. I think my biggest changes in musical landscape where brought on by Metallica in my early teens, Marillion and Bjork at the end of high school, and Tangerine Dream a bit later. Mostly these are emotional references in the sense that I ran into music like this at key periods for me personally. These days I am not so much listening, although Ive been secretly discovering more and more of Steve Roachs work the past few months, along with Patrick OHearn and others that I didnt get to explore earlier on. I am a fairly big into later classical music...Debussy, Stravinsky and others as well. Its kind of hard for me to suss out exactly how the influences might come into play where or when. I tend to really separate myself from other music when working very intensely on something. The way the album happened... all the vocal effects and everything was very natural...as if a light bulb went off in my head! Things just fit together like it was meant to happen, you know? Some will inevitably compare the album to things they know which is fine. I still do the same thing myself, as I am still a fan and listener. I just dont sit around and listen to albums in the dark like years ago, which I miss doing actually. MWE3: Can you say something about your earlier album releases, if they're still available and also about moving from Boston to Oregon. What do you like best about Boston and when did you move and where do you live in Oregon? EM: The last album, The Tide Decides was released on Musea Records and the debut I released on my own imprint in 2005. I had worked indirectly with Musea with my first band who signed to small German label called Angular Records back in 1999. Tomorrows CD release itself may be on Musea, but this album is such a different animal than the album they released last year, so nothing has been decided just yet. As far as space I love the NE and the NW! Best parts of the country. Boston was great because of all the history and it was a special time as I went to college out there for about 5 years. I love the downtown and waterfront, north end...spent many an evening exploring and getting lost in that place. If you go deep into the North End there is a great little coffee spot called Dellos right below a cemetery... on Hull street by this old church I believe. Then you have the bay down below you, intricate courtyards, bridges and boats...everything! Love the atmosphere there. I am in Portland now and have been mostly since 2003. Its a little easier to manage out here in terms of finding your way around. I always knew as a young kid that Id go to Massachusetts (my folks always wondered why I loved Michael Dukakis- it really wasnt the politics of a 7 year old!) and also had a great attraction to Portland. I grew up in Oregon, but not in Portland. When I was very young still my family moved to the country outside the Eugene area. Early on I was in a small town environment, but later on I went to high school in Eugene which is a little bigger and started playing music in bands and out live. MWE3: What would you like to see with Tomorrow Will Tell The Story as far as gaining popularity of the music and are there live shows planned? What is your next musical move? EM: This is the kind of music I believe can reach across the isle and do things for different kinds of people. My only goal is to spread a sense light and being and expanding consciousness. The world is in an extremely shaky time and I can feel it over the last decade for sure. I am hoping this music can calm some nerves and maybe bring some polar opposites together rather than divide. Its been an amazing journey and I am still feeling good about it. EM: Thanks Robert...its been a pleasure!